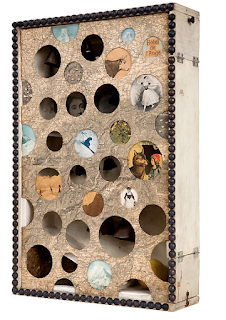 From 4 July - 27 September the artist, Joseph Cornell, will be having a long overdue exhibition at the Royal Academy in London. This shy, intriguing man led an isolated life with his mother and disabled brother in Flushing, New York. He became known for the dream-like boxes he built with treasures collected on his trips into New York City. I am indebted to Joseph Cornell because it was because of him that I was finally able to choose the name for my first novel. It was in Venice at the Peggy Guggenheim Collection when I saw one of his creations, "Swiss Shoot the Chutes" (1941). Fascinated, I stood in front of this box inspired by the penny arcades and pinball machines Cornell had loved as a boy. My eye was first drawn to the lithograph of a ballerina, then to the image below it of the wolf and Little Red Riding Hood. It was only later that I noticed the yellowed words pasted into another peephole: Hôtel de l'Ange. Angel Hotel. I don't know why, but the box conveyed a sense of loneliness and yearning. Coldness. Snow. I realised I had finally hit upon my title (with the addition of one more word), one that incorporated the name of a hotel that seemed to hold such happiness and promise. Not. Stay turned . . .